There is big talk emanating from Europe about the "bazooka" solution to the crisis. It's the talk the Europeans learned from the US. Let's leverage the European Financial Security Facility (EFSF). 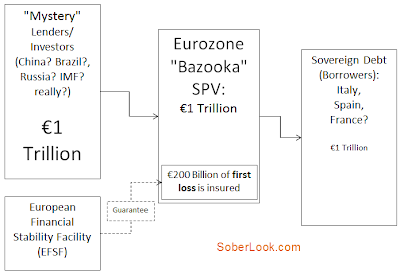 Start with EUR 200 billion and leverage it say five times to obtain a trillion euros of buying power. voila! Magic. Except it doesn't work this way. To obtain leverage you need lenders. And yes, these lenders would be in a more secure position because EFSF will be responsible for the first say 20% of losses (the equity tranche). But no matter how you slice it, you still need 1 trillion euros from somewhere. When a similar transaction was done in the US (TALF), the US Treasury was the first loss and the Fed was the lender. The money ultimately came from the same source. The Treasury could not have done this without the Fed even if they did proved the first loss protection. But that is in fact what the eurozone has been proposing. Initially it was thought that if first-loss is insured, investors will come in droves. Reality however is quite different. Who could be a potential lender in this facility? Maybe China will come in for some amount, although they have not indicated they would do so. Maybe the IMF will lend a small slice, although the US will object to that because of substantial exposure to IMF. It is unlikely that the US Congress during an election year would agree to participate in the eurozone bailout. That leaves the European Central Bank (ECB). The ECB does not have a trillion euros and would need to "print it" (the way the Fed did during QE2). There is little chance however that Germany will allow such an assault on the euro just to bail out what they perceive to be their "less industrious" neighbors. Because of German austerity programs and the integration of East Germany, the current generation of Germans is thought to have a lower standard of living than their parents. And now they are asked to reduce their standard of living further in order to help their southern neighbors? Nevertheless the ECB remains the only viable option and Germany the only obstacle to implementing this. The pressure is building.